Mavid Construction was recently awarded the Minority Business Development State Contract Award during the 37th Annual Marketplace Wisconsin Governor’s Conference on Minority Business Development. The award recognizes the state’s top minority business contractors. 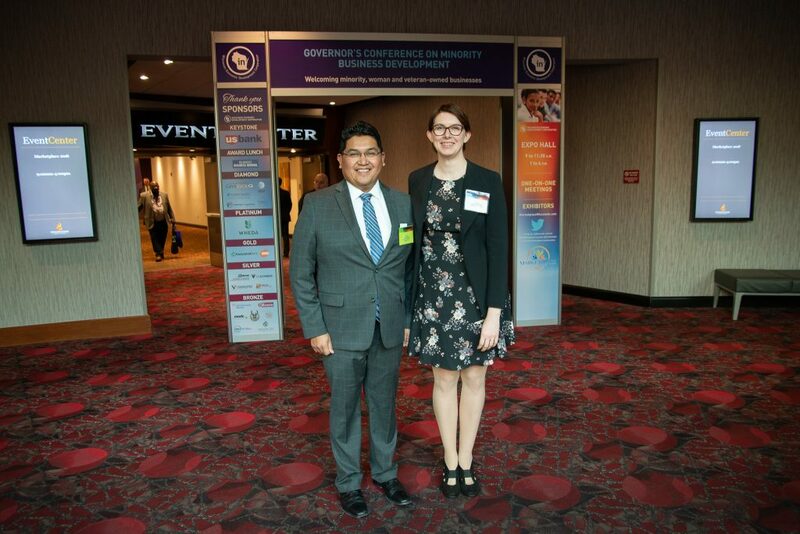 Zoar and Emma Fulwilder attending the Marketplace Wisconsin Governor’s Conference to receive the Minority State Contract Award. The event, held December 12-13 at the Potawatomi Casino and Hotel in Milwaukee, Wis. focuses on providing an opportunity to celebrate and grow Wisconsin’s minority, women and veteran-owned businesses. It is also an opportunity for these businesses to network with each other and those interested in working with them. The Marketplace Wisconsin Governor’s Conference is hosted by the Wisconsin Economic Development Corporation’s Division of Business and Community Development. Dozens of businesses were recognized for their services, ingenuity, and entrepreneurship through different awards during the two-day conference. Additionally, attendees were encouraged to attend workshops and meet one-on-one with different businesses and government agencies looking for specific services. Mavid Construction, a Native American-owned company, was awarded the State Contract Award for 2018 as one of the top Minority Business Enterprise (MBE) contractors for the State. Over the last year, Mavid Construction has completed or started work on a number of University of Wisconsin projects and other governmental agencies. Mavid Construction was last honored with this award in 2012. Mavid Construction was also named the 2018 Minority-Owned Business of the Year by The Daily Reporter. Mavid Construction Services LLC, a State of Wisconsin MBE certified contractor, specializes in metal stud and drywall, commercial flooring, glass and glazing, acoustical ceilings and commercial doors and hardware. The union-affiliated company based out of Green Bay, Wis. can be reached on the web at www.mavidconstruction.com.